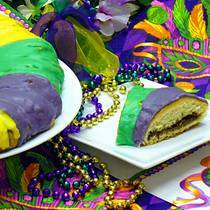 Fat Tuesday is around the corner, and it’s celebrated with, well, lots of decadent food (to ready ourselves for the lean eating during Lent) and, of course, King Cake. Traditional King Cake is a yeasted dough, and today I’m sharing 2 easier recipes that are really good. Adapted from a recipe from Julie Badylak, a busy mom of 3 and physical therapist at Children’s Hospital. Julie’s original recipe came from her boss, who’s been making it for 3 decades! Julie’s version is called “Chocolate Chip Cake” and she adds 1/2 pack mini chocolate chips into the batter as the last ingredient . She sprinkles the cake with powdered sugar after it cools. So to make it a King Cake, I left out the chips and added cinnamon. Of course, King Cake’s are usually yeasted cakes with a cinnamon filling but this one is easier and fills the bill. Now if you want, you can also toss in a handful of chopped nuts with the dry ingredients. The icing sums it all up: purple for justice, green for faith and yellow for power. The baby represents the “king” and whoever gets it will be blessed with good fortune…..
Spray a Bundt pan. Preheat oven to 350. Beat everything except for baby well. Pour into prepared Bundt pan. Push baby in and keep it away from sides of pan. Bake 350 degrees for 45 minutes or until toothpick inserted in center comes out clean. Cool 10 minutes and remove from pan. Once completely cool, frost. 2 teaspoons vanilla and enough water to make a thick glaze – start with 4 tablespoons and go from there. Divide into 3 portions and color if you like: purple, green and yellow, or leave plain and frost cake. Either way, sprinkle with green, purple and yellow colored sugars before frosting sets. 2 rolls (total of 12 individual crescent rolls) refrigerated crescent rolls in the ca. Place cream cheese, brown sugar, cinnamon, and raisins in food processor w/metal blade. Process until combined. Add nuts and plus until chopped in about 1/4″ pieces. Set aside. Preheat oven to 350 F. Spray cookie sheet.Unroll crescent roll dough and separate into triangles. Position triangles next to each other with the points toward the center, overlapping the long sides about 1/4-inch, forming a large round. Where the pieces overlap, press the seams together only in the center of each seam, leaving either ends of the seams unsealed so you can fold them up over the filling. Spread the filling around in a ring covering the center sealed seam of each triangle. Place a small plastic baby or dried bean somewhere in the filling. Bake 20 to 25 minutes until golden brown. Let cool to room temperature before frosting. rim of the pan to fully enclose the filling, tucking under the points. Lightly press the seams.